Storage bedroom features queen platform bed with two full-extension drawers, a 10-drawer dresser and matching mirror. 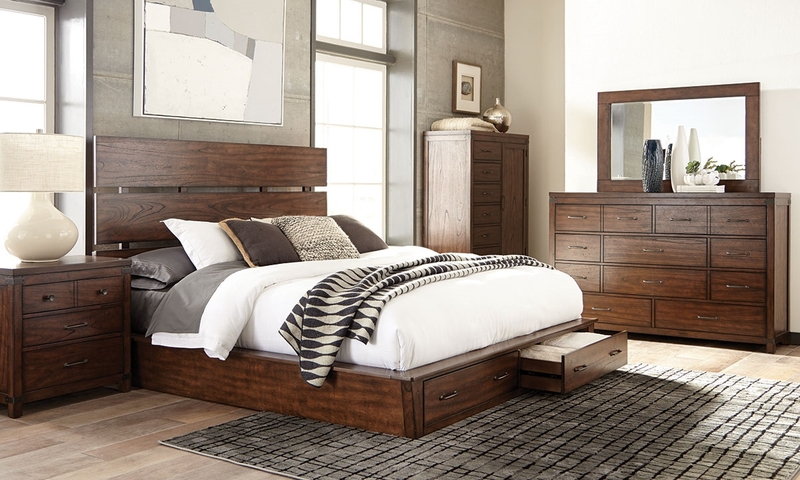 The Artesia collection from Scott Living offers a more modern take on British military campaign furniture with its platform bed featuring a plank-style headboard, and a tall mule dresser with matching mirror. While the bed features two spacious, full-extension drawers at the foot, the dresser offers ample storage space with a total of 10 drawers. All feature durable English dovetail construction, and the top drawers offer a safe place for more delicate items with black felt lining and a jewelry tray. Metal handles and accents offer a nod to this suite’s traditional roots, while mindy veneers in a dark cocoa finish bring warmth to each piece. Matching nightstand and chest also available. See store for details. King size platform bed with a slatted headboard in a dark brown finish features two dovetailed footboard drawers on full extension slides. 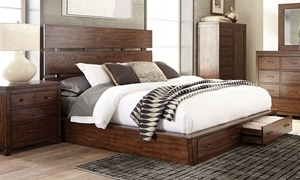 Queen size platform bed with a slatted headboard in a dark brown finish features two dovetailed footboard drawers on full extension slides.